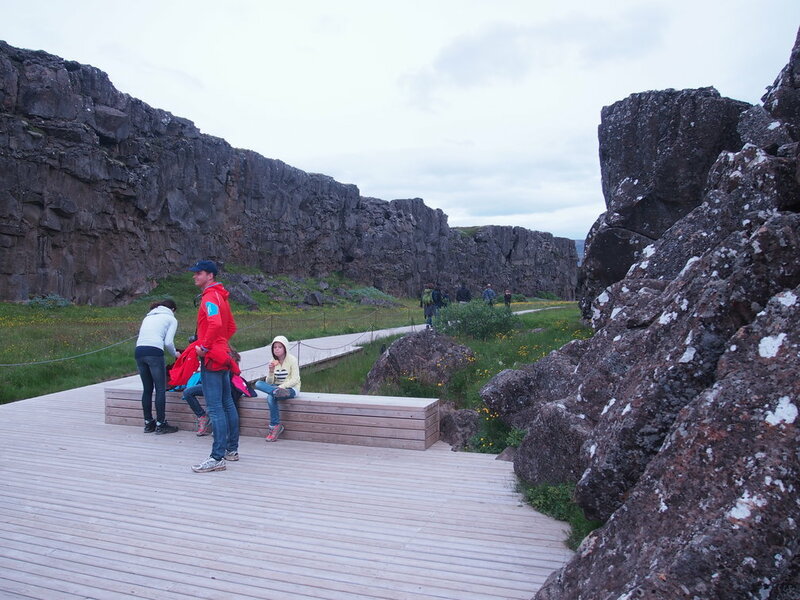 Our first stop was Þingvellir, a rift valley where North America and Europe are drifting apart at a rate of 7 mm a year. The valley lined with long stone walls, that look like they just cracked open (which they probably did). North America is to the left. And with lots of smaller cracks as well. 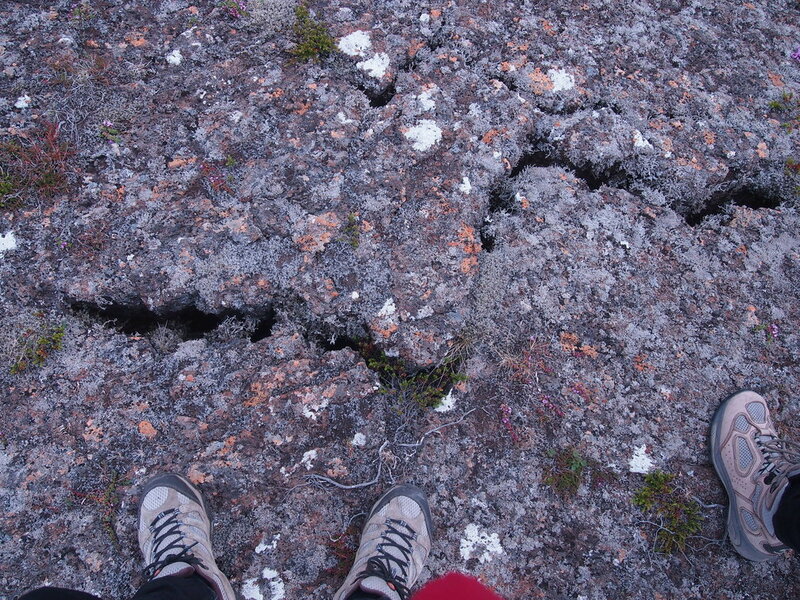 Who knows, in a couple of centuries, how big this crack will be? 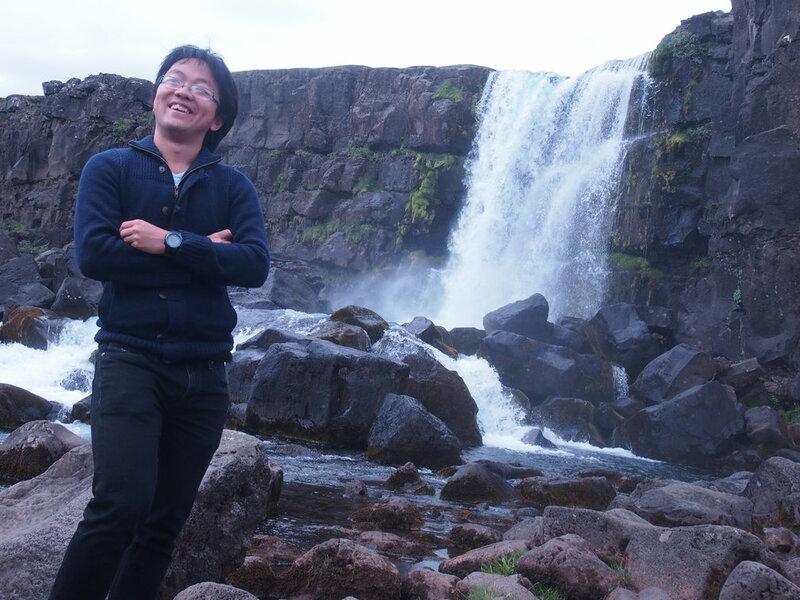 And there was a waterfall! 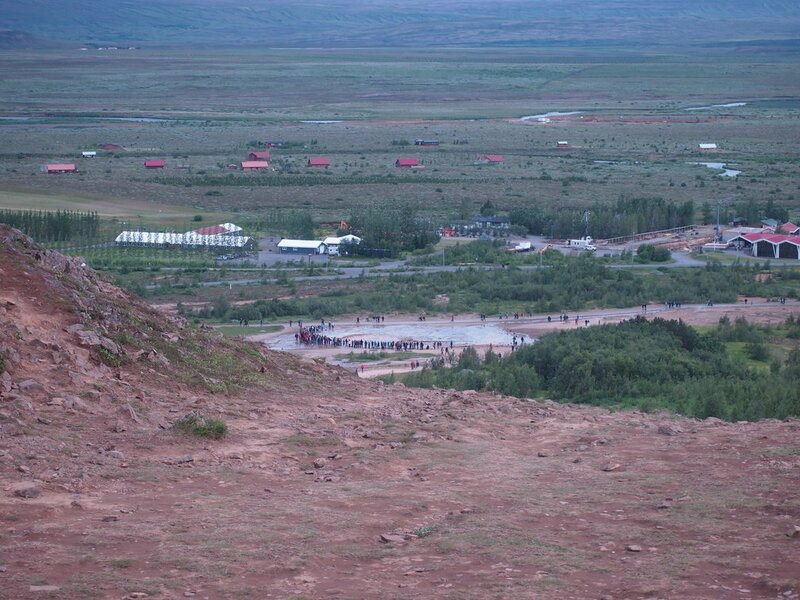 Next, we went to Geysir, which is where the word geyser comes from. 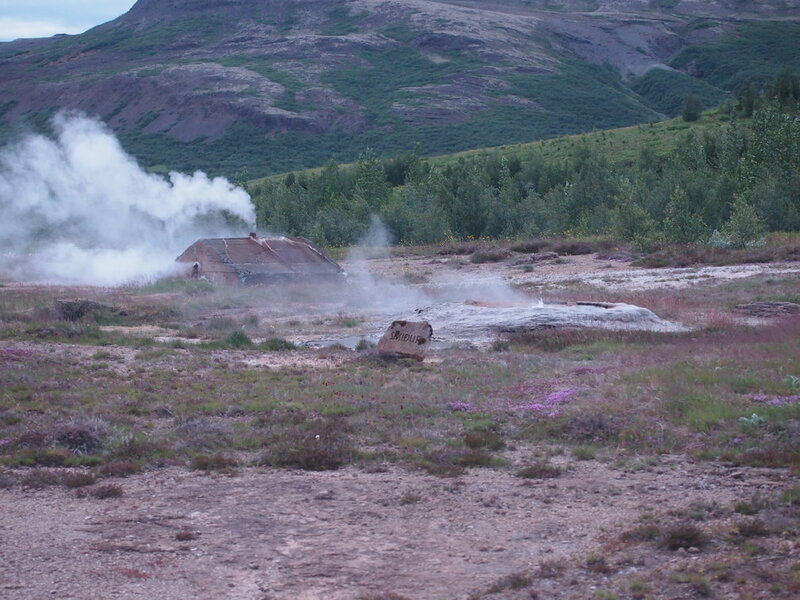 The area is dotted with small vents from which the Earth is smoking. It smells of sulphur. 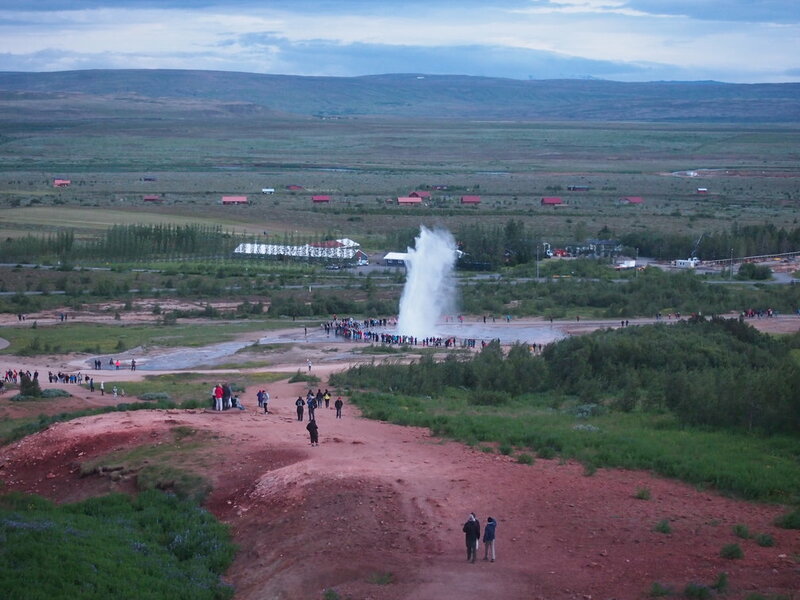 This is the original geyser Geysir. Nowadays, it is mostly inactive, and only erupts after earthquakes. 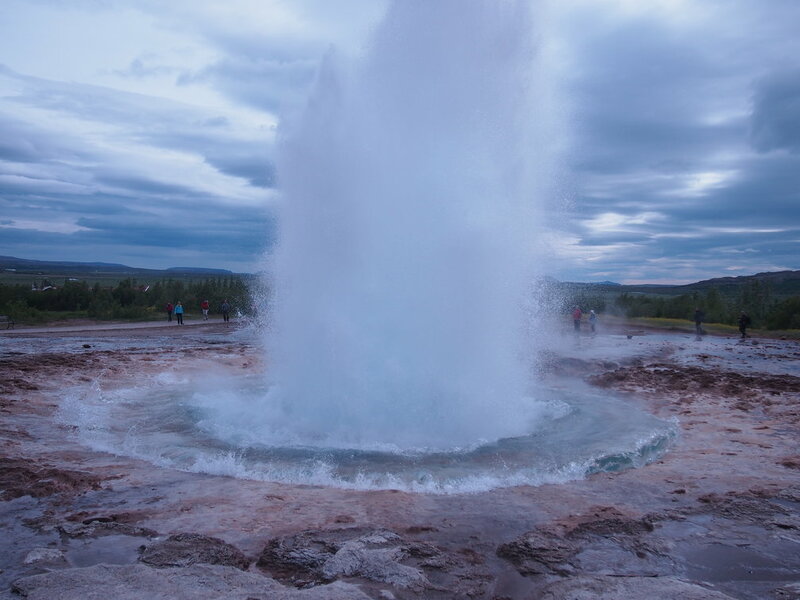 The nearby Strokkur geyser is very much not inactive. It erupt every 7–10 minutes, and this is what it looks like. The best part of this area was climbing up the nearby rock. 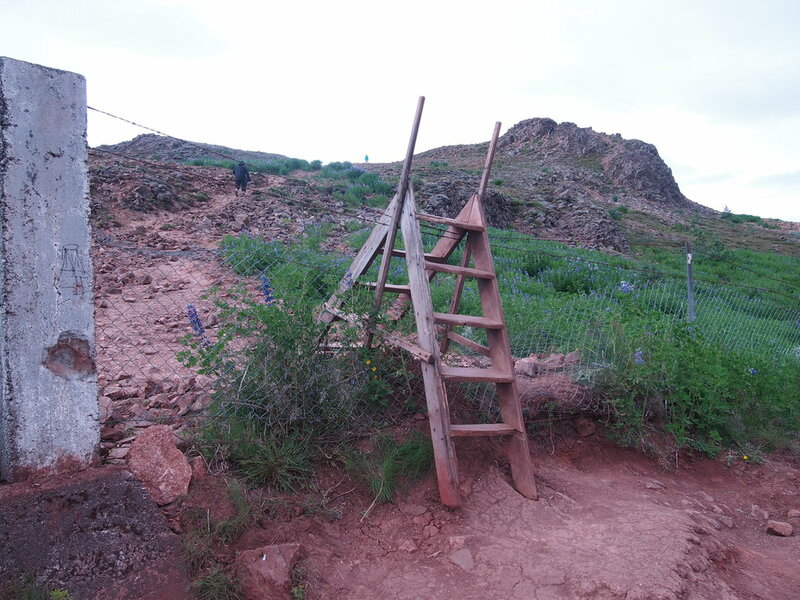 It offers incredible views over the next valley. 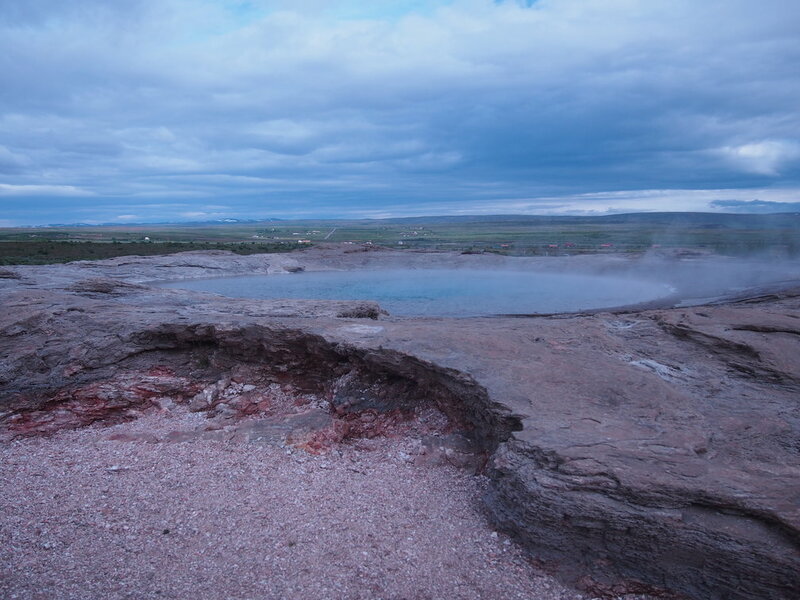 And you can look back at Strokkur. 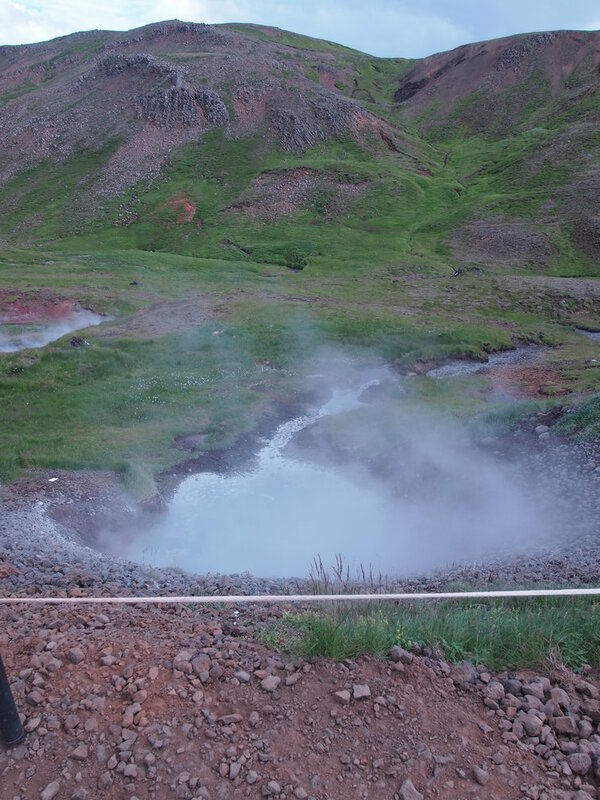 As you can imagine, when you have a geyser that erupts every 7–10 minutes, there will be a ring of people around it, holding up their cameras, waiting for it to erupt. 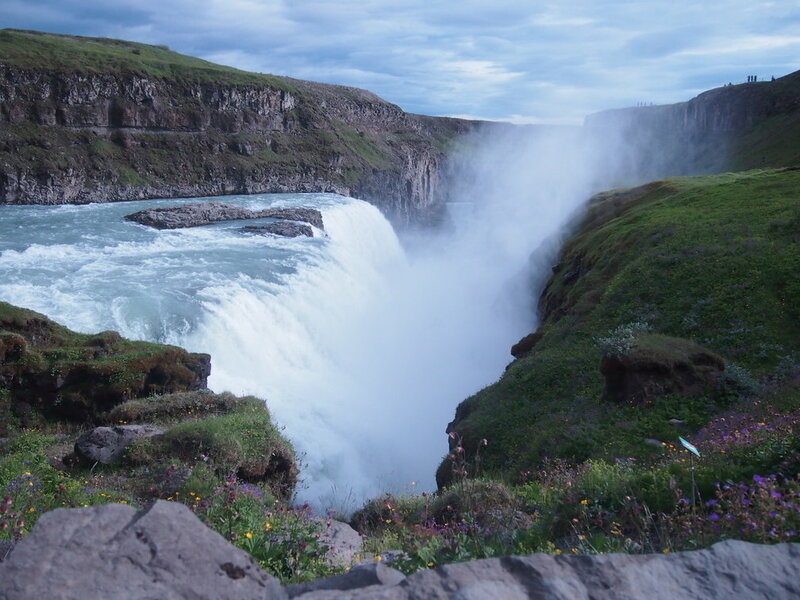 The next stop was the waterfall Gullfoss. We had no trouble finding it, you can hear it from pretty far away. Up closer, you can barely see the gorge that it flows into, through all the mist. 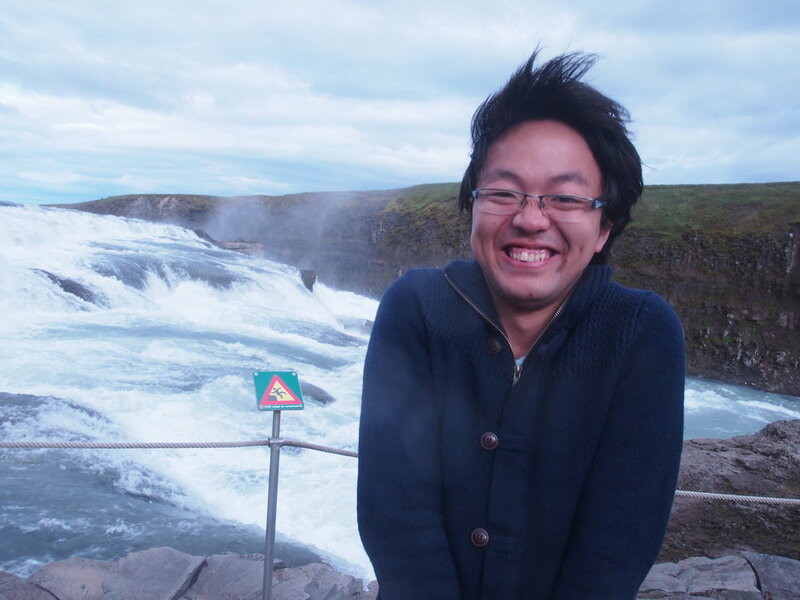 With all the water flying around, it was really chilly! 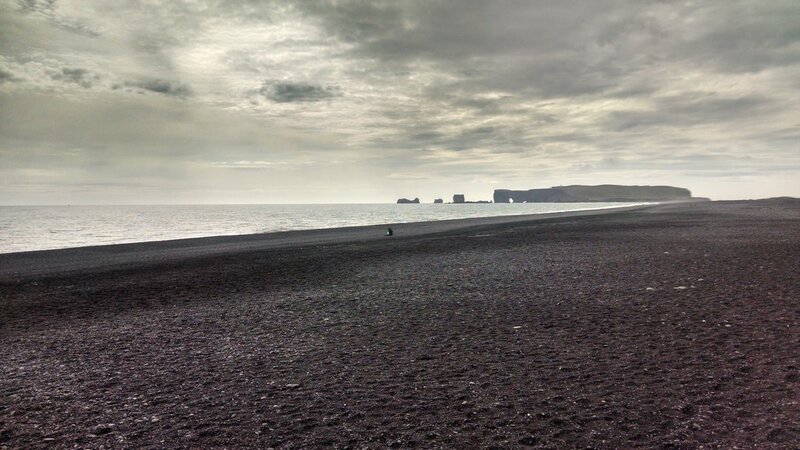 The second day, we ventured out to Reynisfjara, the “Black Sand Beach”, about a 2.5 hour drive from Reykjavik. The views along the way were fantastic. 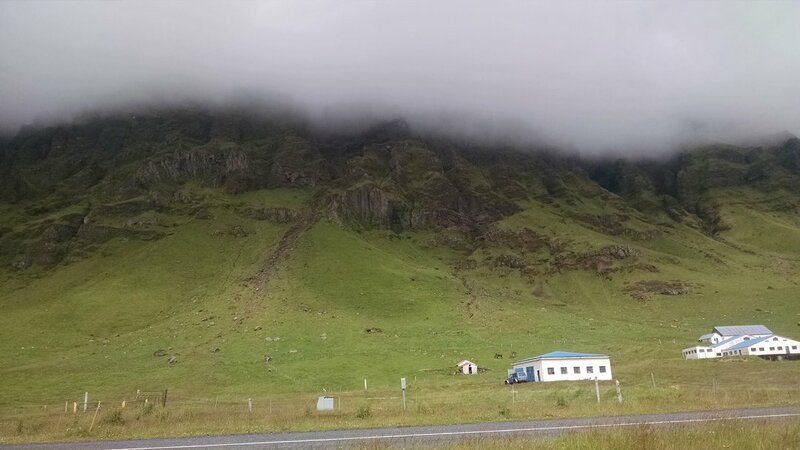 Somewhere, up behind the mist, is Eyjafjallajökull, the volcano that erupted in 2010 and shut down air travel in most of Europe. 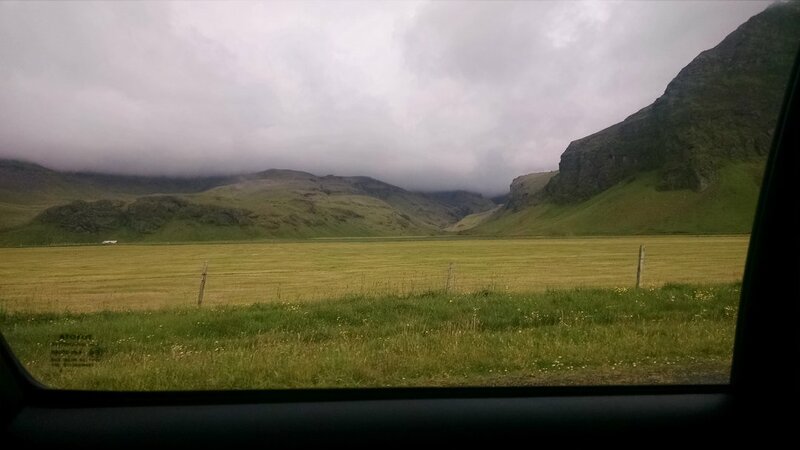 Sometimes, we just had to stop the car, to really take in the view. 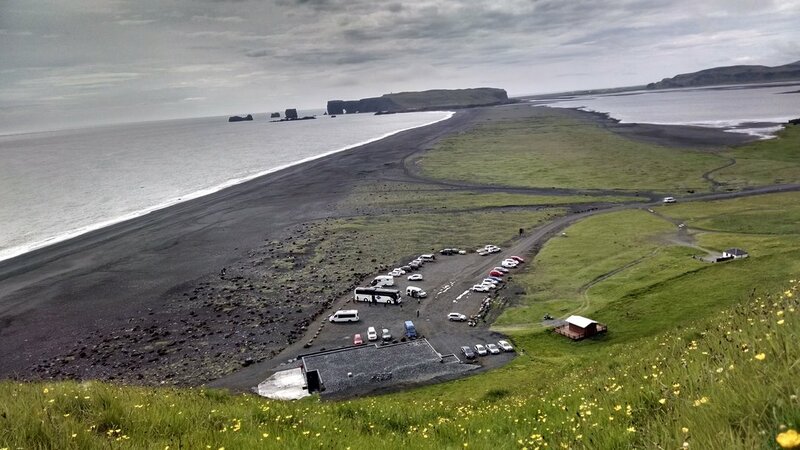 Finally, we arrived at the volcanic beach. The sand really was black! 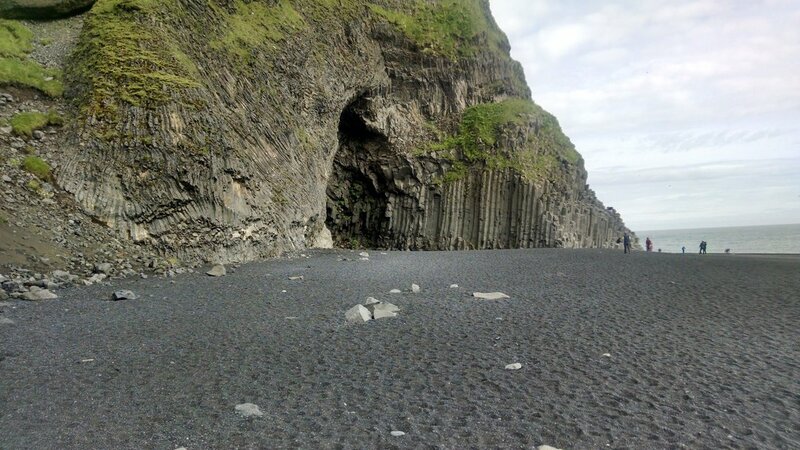 The rock by the beach looked liked it was growing upwards in long rectangular blocks around the cave. 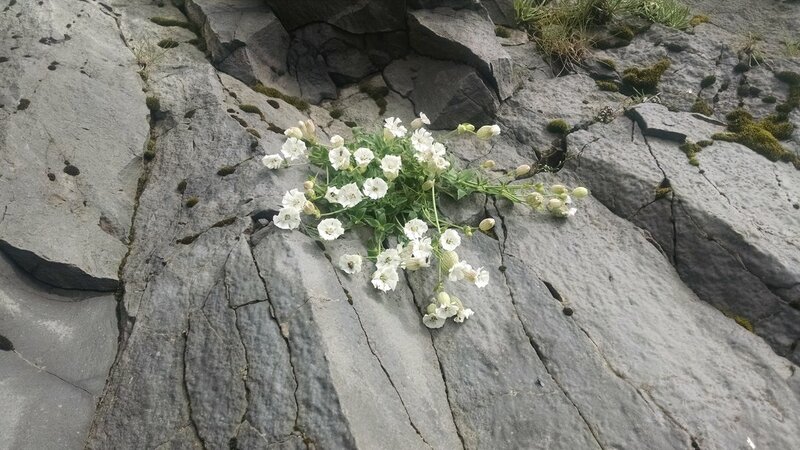 And there were flowers growing in turn on the rock! We also climbed up the steep hillside, because why not? 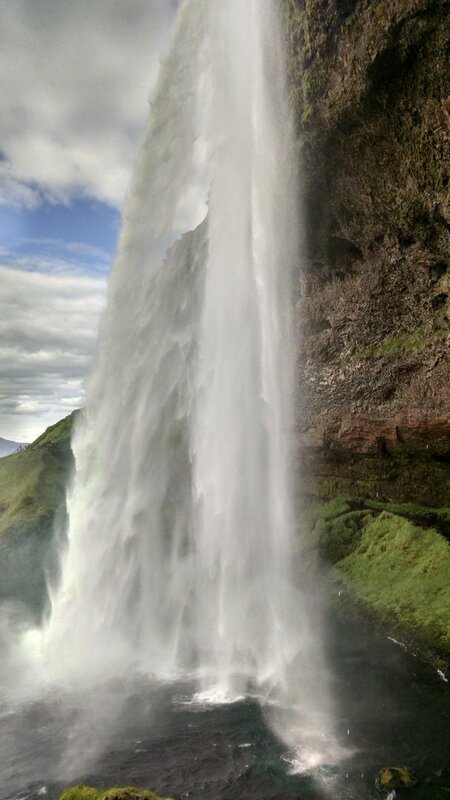 On the way back, we stopped by Seljalandsfoss, another beautiful waterfall. And the sun had come out! 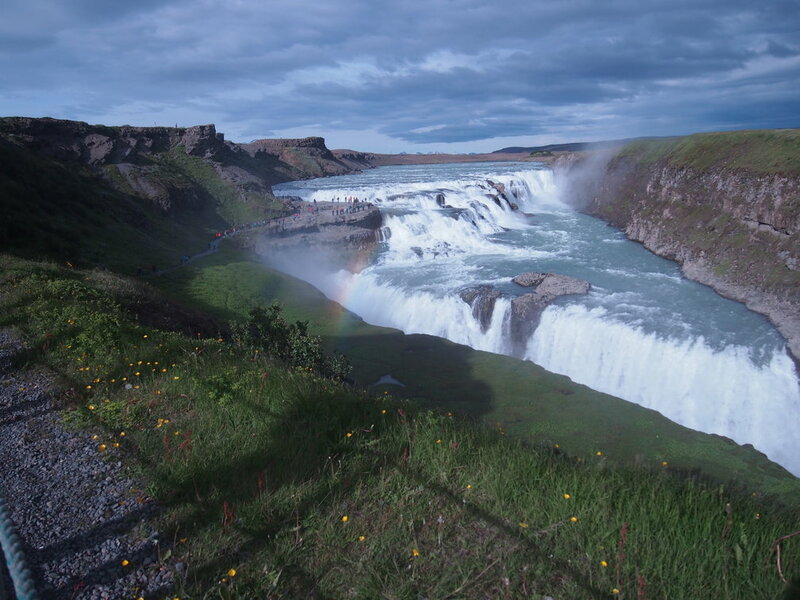 And you can walk right to the waterfall, and even behind it! 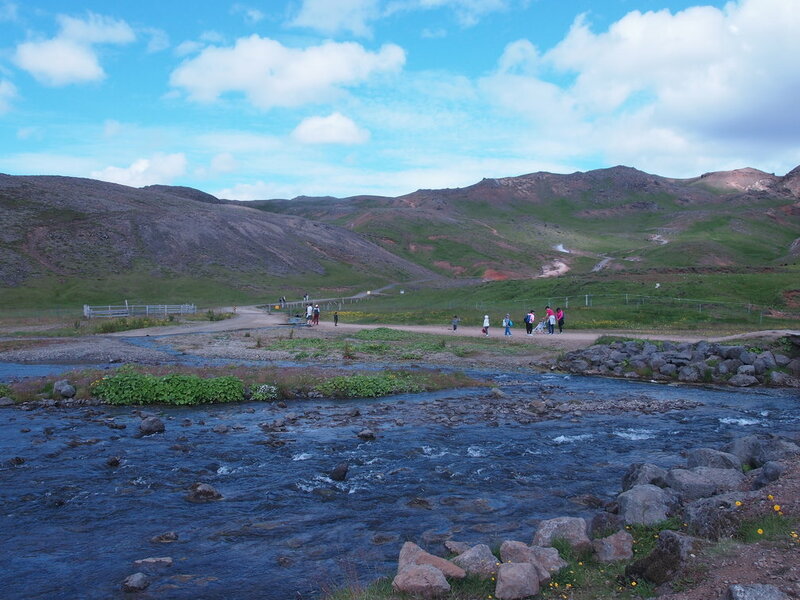 On the third day in Iceland, we went for a hiking trip. It started like this. Notice how the ground is smoking in the distance! 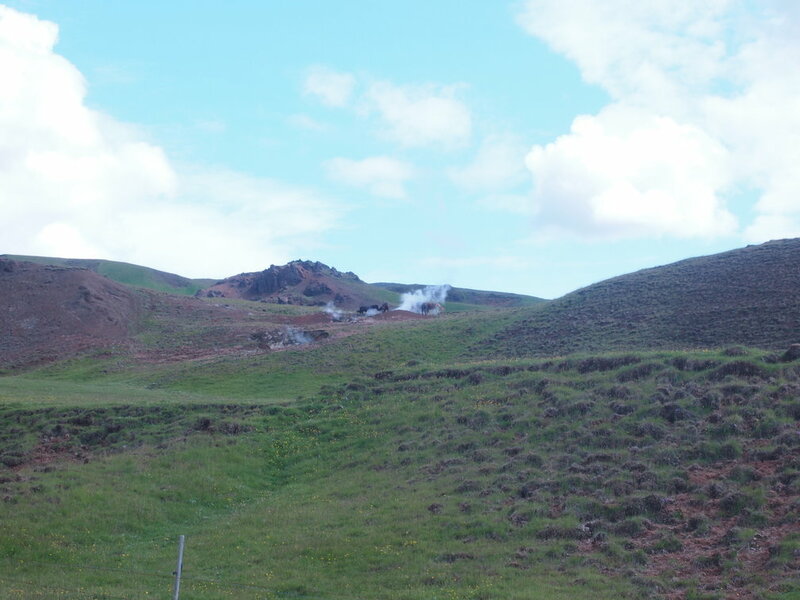 One of the best sights on the hike: a group of horses in the distance, just casually hanging out by the fumarole (a new word I learned on the trip). 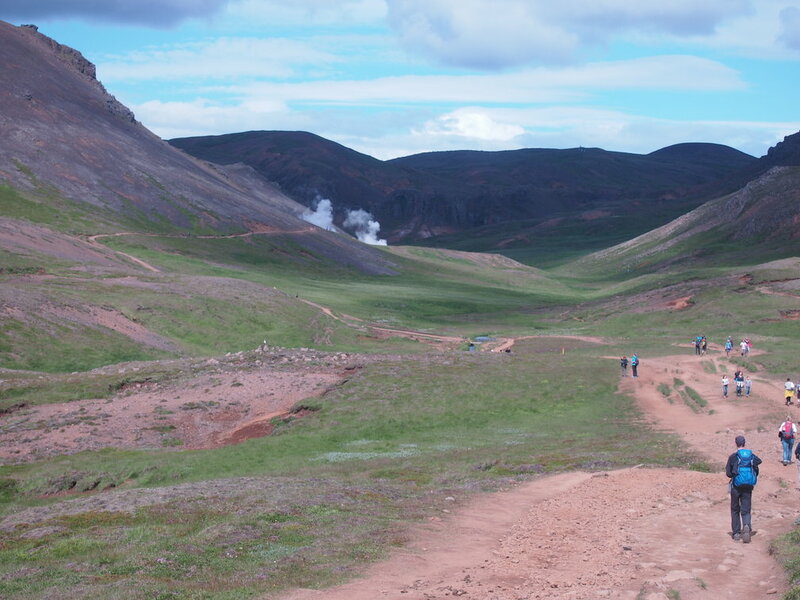 Across the hills we go, and there are more fumaroles in the distance. 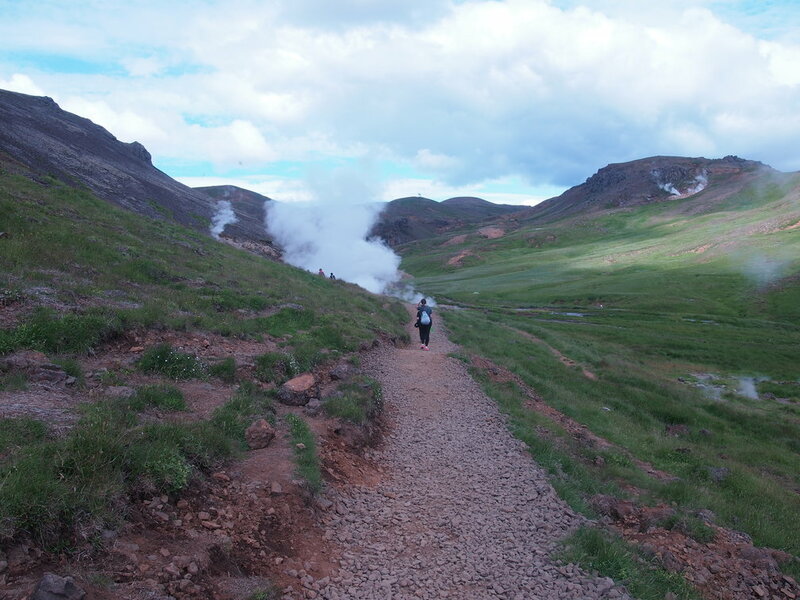 The trail passes right next to of the fumaroles. It smells of sulphur. 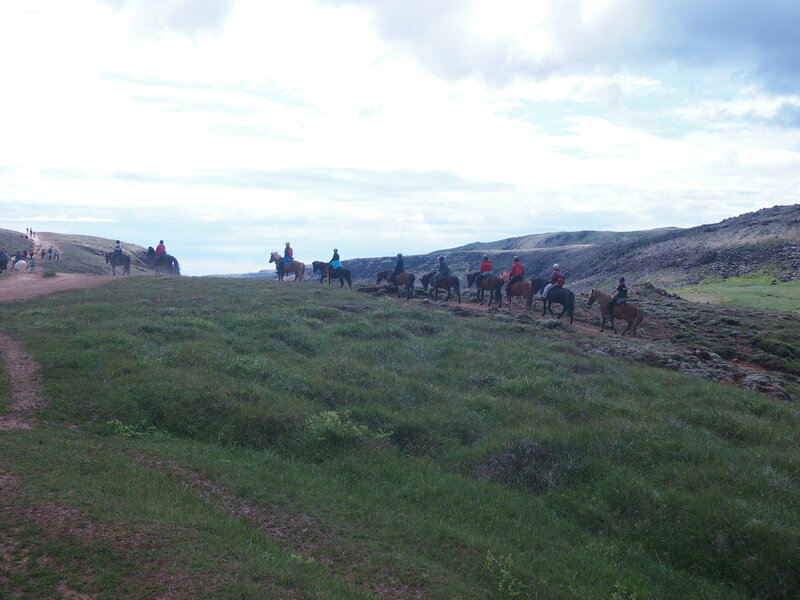 Aside from all the hikers on the trail, there were also several groups of people on horses riding by. Here and there were streams with steaming hot water. 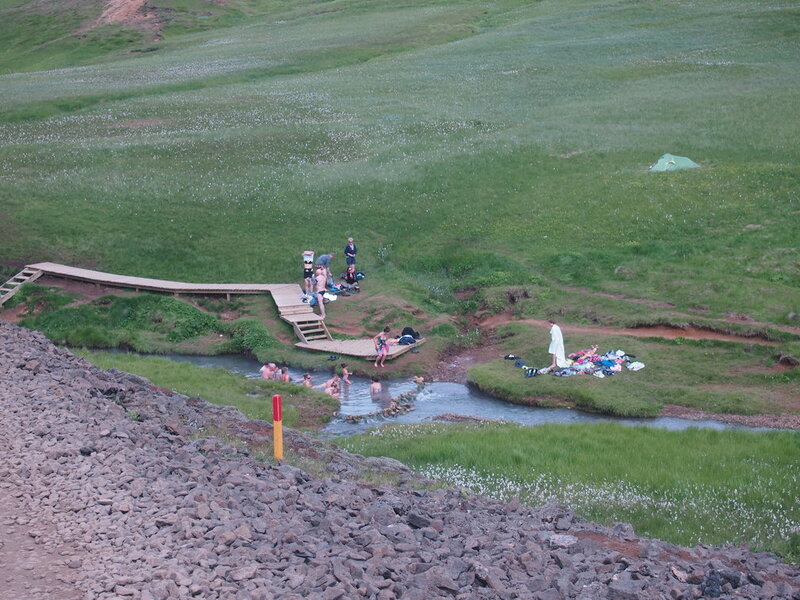 Which is the real reason we came to this spot, in Reynisdalur: to take a bath in the hot springs! 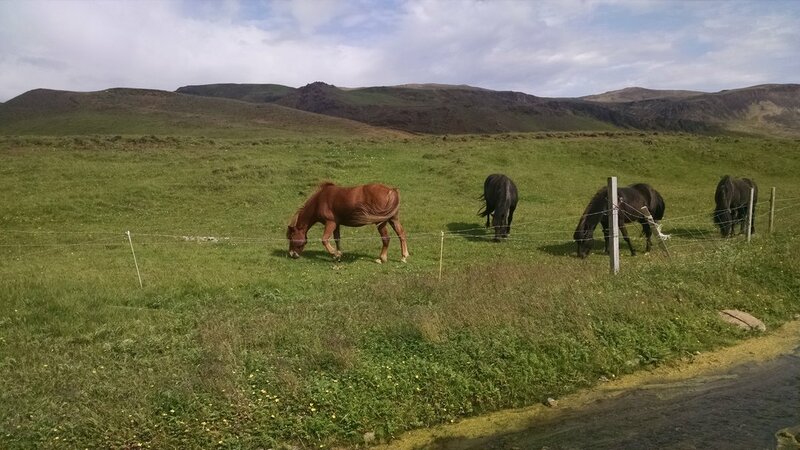 By the time we had hiked down, the horses had gotten tired of hanging out by the fumarole, and were just grazing around instead. And that’s it! We came back, really exhausted, and left early in the morning of the fourth day. All in all, an unforgettable trip!